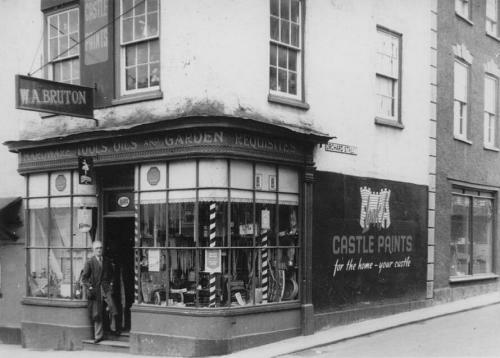 This photo shows my late father, William Arthur Bruton outside his ironmongers shop at 18 Long Street. I believe it was taken during the late 1940’s or early 1950’s. He sold the business during the middle 1950’s and retired to a new property in Queensway - No:- 1. He died there in 1957. He was a one time member of the local council and also the rifle club which met, I believe, in the attic of a pub at the top of Long Street. My family moved to Wotton in 1940 and I then attended the school near the church. Convent of the Holy Cross. After that I went to KLBGS and then to the Bristol college of Technology to do a course in institutional management. My first job was at Rose Hill School as assistant matron during which I met my husband to be. He lived in Sevenoaks in Kent but knew the school via a friend who worked there who in turn was introduced to the school via a contact at Cotswold Collotype. I was a bellringer at St Mary's Church and was also involved with local Brownies and Guides. In 1958 my then widowed mother and I moved to Sevenoaks. I married in Sevenoaks and have lived there ever since, occasionally passing through Wotton - and reminiscing - when visiting an old friend - Cynthia Curtis nee Browning - in Stinchcombe. It may be of interest to know that a lifelong friend, Ann Griffiths nee Willcock (married Peter Griffiths) who lived in Wotton now lives in Meopham in Kent, about 12 miles from Sevenoaks.